REAL religious liberty includes the freedom to live according to the values taught by one’s faith, Pope Francis said. 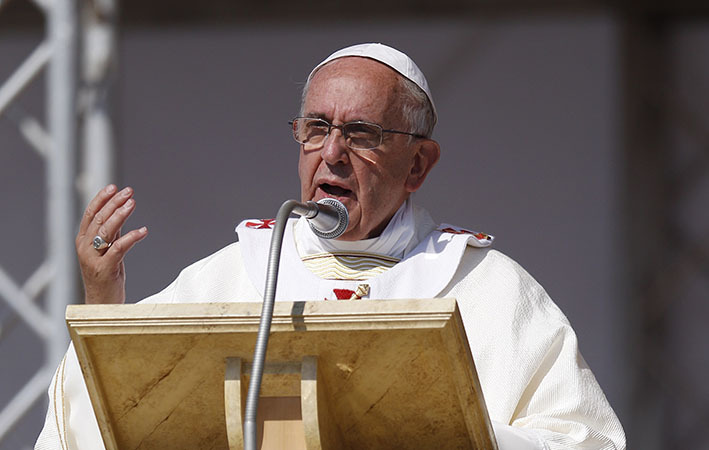 The Pope addressed organisers, speakers and participants in a Rome conference, “International Religious Liberty and the Global Clash of Values”. The conference was organised by the centres for Law and Religion and for International and Comparative Law at St John’s University in New York and the Department of Law at Rome’s LUMSA University. Pope Francis said ensuring people’s right to live their religious values was increasingly difficult in the modern world “where weak thinking – this is a sickness – lowers the level of ethics in general and, in the name of a false understanding of tolerance, ends up persecuting those who defend the truth about the human person and its ethical consequences”. A natural part of being human, he said, was seeking the truth about the origin and ultimate destiny of one’s life, one’s connection to the cosmos and one’s place in history. “In the human mind and heart there arise questions and thoughts that cannot be repressed or suffocated” because they emerged naturally, he said. Religious freedom was a “fundamental right of the human person” and a recognition of the dignity of the human capability “to seek the truth and adhere to it”, the Pope said. National and international laws and organisations must “recognise, guarantee and protect religious liberty”, the Pope said. Religious freedom was “an indicator of a healthy democracy and one of the principal sources of a nation’s legitimacy”. As he has said repeatedly, Pope Francis told the conference participants it was “incomprehensible and worrying” that even as worldwide appeals to human rights grew, “discrimination and restriction of rights persist based only on belonging to and publicly professing a certain faith”. “It is unacceptable that real persecution – and even wars – continue based on religious belonging,” he said.